AFA Tooling Brand Deburring Tool makes a great all-purpose finishing tool not only in the garage, but the workshop as well. 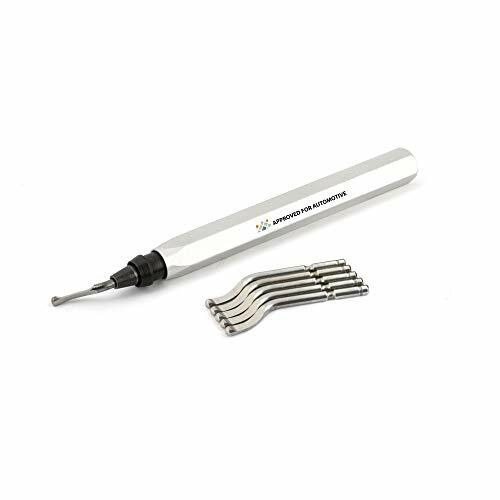 Lightweight and comfortable aluminum handled deburring tool and additional 5 BS1018 blades designed by the tool brand known for going above and beyond for the ''simple tasks perfected" approach to research and development, Approved for Automotive. Hard metal burrs are one of the leading causes for equipment failure. The BS1018 blades are designed to quickly and easily remove hard metal burrs in hard to reach but essential areas. Thus decreasing the chance of machine breakdowns. For the hobbyist, no toolbox is complete without the proper blade for deburring. Anywhere hard metals, such as stainless steel, need finishing, the AFA Tooling BS1018 deburring tool kit gets the job done. Manual deburring tool designed for hard metals such as stainless steel and other extra hard metals. High density BS1018 deburr blades are specifically designed to withstand the rigours of deburring harder than normal metals while maintaining sharpness and shape. Fine detail work requires the right tool for the right job. The AFA Tooling BS 1018 blades reach those hard to get to spots and quickly remove metal burrs and flakes where other blades fail. Easy grip lightweight aluminum handle allows for a firm grasp and comfort during extended use. Kit includes one AFA Tooling brand aluminum handle deburring tool with BS1018 blade plus 5 extra BS1018 blades. View More In Deburring Cutters. If you have any questions about this product by Approved for Automotive, contact us by completing and submitting the form below. If you are looking for a specif part number, please include it with your message.